Sitting on the edge of my bed, I glance over at the time. 05:42. Yuck. Getting up this early gets easier and easier all the time, but there are still those mornings when it takes a while to get the blood flowing. I ooze out of bed and glance out the window. Still dark. In this part of the world, we get twelve hours of darkness and twelve hours of light every day throughout the year. The sound of the call to prayer from one of the mosques here in Kampala drifts through the window and I smile. When we first arrived, that sound woke us up almost every morning but now we hardly notice it. As I wander into the bathroom to prepare for my day I send up a quick little prayer for those who have responded to that call to prayer and are kneeling on their prayer rugs. What will their day be like? After a quick shower and a piece of toast, I check on the supply of food and water in my flight bag and then head out the door. The sound of the padlock clanking on the front gate of the house as I open it carries through the yard, and our night guard comes over to open the main yard gate for me and let me out. Leaving the yard I turn right, making my way up the hill to the MAF office. We pilots carry our own keys to the office, as we are usually there before anyone else is even thinking about heading out in the morning. I walk through the bookings office and into the "cage", our freight room that has its own lock and where our manifests are waiting for us in the morning. I quickly scan over my manifest for anything unusual and notice that I am scheduled to land today in Parajok, South Sudan. I have not been there before and we have not landed there in quite a while. Last week one of the other pilots did a low pass over the airstrip, and had several concerns about what he saw. A telephone call yesterday informed us that the grass cutting that we had asked for had indeed been done, but if things don't look decent when I arrive, I will not be landing and the group that has come from the USA for the week will end up spending their week back in Kampala, wondering why they came all the way here to sit in a motel for the week. I grab the keys for one of the ops cars and head out the door. As I drive out the office gate and begin the 30 minute drive to our airfield, a soft orange glow starts to fill the sky as the suns warming rays begin to make their presence known. Turning off the main road into Kajjansi town, I can't help but to appreciate the smooth dirt road that I am now driving on. It was graded last week for the first time in about two years, and though it has already begun to deteriorate again it feels like smooth asphalt compared to what it was like a while back. As I pull through security and make my way airside at Kajjansi airfield, I glance down the hill to where our planes are parked. Our operations crew have been here for a little while already, and the planes are unlocked and ready for our arrival. I park in front of our terminal building and take my manifest up to the check in desk. The group from the States is there and are just starting to check in. I have a quick word with their leader, who informs me that there was rain in Parajok yesterday, but that he has received word that the airstrip is prepared for us and is in decent shape. Leaving the terminal and walking down to my plane for the day, I hope that the word he received is accurate. One small thing that we pilots have to remember is that the people who live up country and provide us with airstrip updates tend to be... optimistic in their reporting of airstrip conditions. They want the plane to come in as much (or more) than the passengers do. Well, in this case we'll be finding out in a few hours time when we arrive there. My pre-flight checks on the airplane reveal nothing unusual, and after taking on some fuel and loading my passengers, I launch off of runway one-four and into the blue morning skies. After a little rain during the night, the clouds have moved off and the air is now smooth as glass. Visibility has also improved during the last few weeks, and as I look eastward I can see Jinja in the distance, the source of the Nile river. The river snakes its way northward like a silvery thread binding the country together, On a day like this we will be able to see the river for our entire flight northwards into South Sudan. Other than the passengers for Parajok, I have one lady who will be going onwards to Yei (pronounced "yay") after we leave Parajok. The flight northwards goes really well, and before long I am bringing the power lever back and lowering the nose at the top of my descent. About twenty miles out of Parajok I finally spot the light sliver of green that marks the airstrip where the grass has been cut much shorter than the grass surrounding it. I ease the power lever forward again and level off one thousand feet above the airstrip. As I pass overhead initially, I look down and get my first look at Parajok airstrip. From up here it doesn't look too bad. I can see the clear brown line in the dirt where the people have worn a smooth footpath in the center of the airstrip. Having heard of the rain yesterday, I have a good look up and down the strip, trying to make out any sign of standing water or off coloured soft spots. I can't see any. I go through my pre-landing checks. Fuel selectors: Both On, Ignition: On, Recognition Lights: On, Brakes: Check for pressure, Inertial Separator: Bypass, Radar Altimeter: Set for 200 feet, Abort Point and Emergency procedures: reviewed. I make the turn onto final approach and prepare for my low pass. I'll be doing a pass at around 10 feet above the ground, right down the center of the airstrip so that I can have a very close, detailed look at the condition of the airstrip and make the final decision about if I will land there or not. Bringing the power back, I lower the plane down into position and increase the power as I pass over the end of the airstrip. Increasing power as I fly down the strip, I have a lot of energy built up by the time I bring the nose up at the end of the runway, and in a few seconds we are again flying one thousand feet above the ground. Based on my assessment, there is no reason why I cannot safely land and take off here. I go through my checks again and bring all of my focus and attention into landing on the spot that I have picked out to touch down on. Details begin to emerge and I become more aware of the sensation of speed as the ground rushes up to meet us. Bringing the power lever back to idle position, I raise the nose and we touch down. The nose wheel lowers to the ground and I move the power lever into beta range to assist in the braking process. I have landed into the wind and slightly downhill, but things have gone so well that there is no need to use excessive braking to slow down, and we coast smoothly to the end of the airstrip and turn around to park. Even before I have shut the engine down, people are running up to the airstrip and congregating around the plane. An airplane landing here is cause for a social event, and everything will shut down in the village until I take off again. After shut-down, I open the door to be greeted by a blast of hot (in the +40's), Sudanese air. Sweat begins to pour down my face even as I climb down out of the airplane to greet those who have gathered and to let the passengers out. 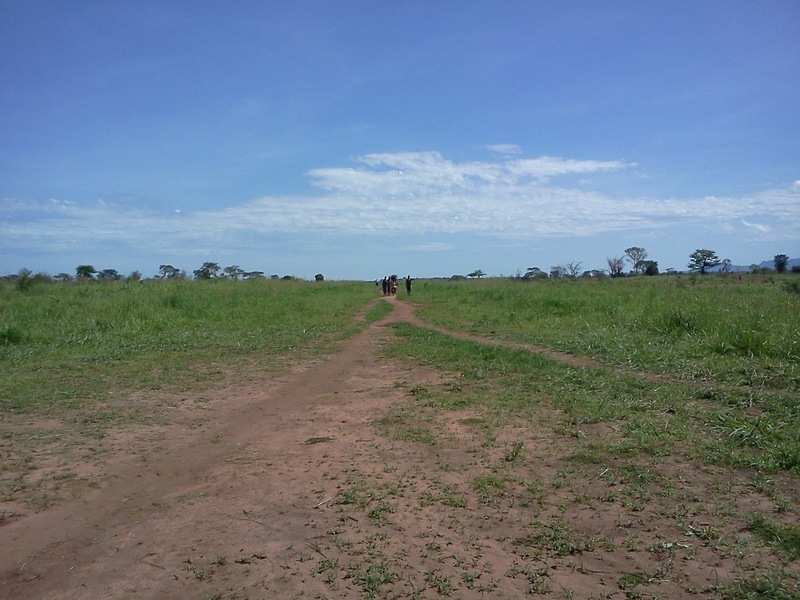 Sudanese villagers walking down the airstrip to see who has come to visit. north and there is no reason to rush off. I also want to walk up and down the strip and take a good look at the conditions on the ground before leaving. Someone else will have to land here in a few days to pick this team back up, and firsthand knowledge is always preferable to information gleaned over the phone. After a walk up and down the strip I am glad that I have landed here. The strip is in great shape. There is evidence of the rain that fell yesterday, but it has drained off nicely and the ground is very firm the whole length of the strip. It is adequately wide, and they have also taken the time to cut the grass at either end of the runway, giving me the space that I need to turn around when I am ready to take off. There are no termite mounds or even evidence of recent termite activity, and I can also see where a few holes and bumps have been filled in and leveled off. I can think of several other strips that are actually in worse shape than this one is. Sudan. I give a couple local kids a look into the airplane, and they pretend that they are staying on the plane and flying out, to the great amusement of their friends. Lifting up the stairs, I close the plane up and start up the engine for departure. After walking the airstrip I have no worries about soft ground or getting stuck, and I taxi with confidence back up to the top end of the airstrip. Adding power, we accelerate swiftly down the strip and lift smoothly into the air, climbing up over the heads of the people who will stay and watch us until we can no longer be seen. It will have been the social event of the day for them. Climbing away from Parajok, I am glad that things went so well there, and that the pick up there next week doesn't look like it will be a problem. Leveling off at 10,500 feet, I take a westward heading towards Yei. We have a nice tailwind for this leg of the flight, and I lean back in my seat and enjoy the ride as the plains and forests of South Sudan roll past beneath us. Almost before I have a chance to blink I am once again preparing to land the plane, this time at Yei. 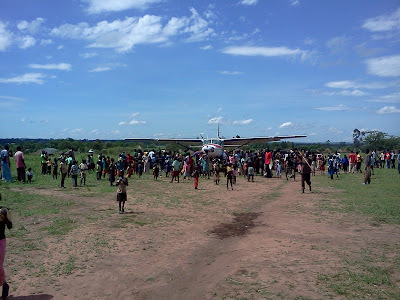 Yei airstrip is a long, red strip of dirt that is cut out of the forest that surrounds it, and we land there almost every time that we fly into South Sudan. Today I am dropping off my one remaining passenger and then picking up three fellow Canadians who are heading back home after a vision trip in the area around Yei. Things go smoothly and swiftly on the ground, and I am soon taxiing out for departure for Uganda. 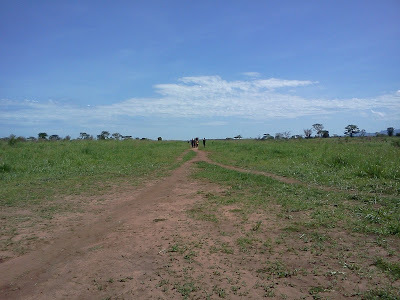 Take-off out of Yei is fine, and I intentionally turn the wrong way after take-off so that we can circle around and pass back directly over the airstrip again, giving my passengers one last look at the place where they have spent the last few weeks working. The afternoon has snuck up on me, and I feel the convective air currents begin to bump us around as we climb out of Yei. It's only a short 30 minute flight down to Arua, Uganda, where I will stop to take on fuel, but I decide to climb a little bit higher anyway so that we are riding in the smooth air up above the clouds. As I make my first radio call after leveling off, I hear another MAF plane on the radio, also heading into Arua. It's Phil Henderson, another Canadian pilot. He and I shared an office for several years while we worked together at Prairie School of Mission Aviation (PSMA) and this will be the first time that we will bump into each other up country. Phil and I in Arua, with our planes in the background. Landing in Arua, I bring the plane smoothly to a stop beside Phil's plane, and let my passengers disembark. Phil is the pilot who dropped them off a while ago, so while Phil and I both take fuel they renew acquaintances with each other. Phil and I then pose for a picture which we plan to send back to our friends at PSMA. Phil is doing some initial training in the Caravan with the MAF Uganda program, but is soon headed to serve in the program in Chad. We have to take advantage of these opportunities for the short time that he is here flying in Uganda. As Phil taxi's out, I start up and turn my radio on just in time to hear Phil make a newbie mistake on the radio, announcing that he is "Taking off runway one-three". I grin to myself and hold short of the runway while Phil takes off of runway one-eight. These things happen to all of us at the end of a long day. A few minutes later it's my turn to take off, and soon I am leveling off at 11,500 feet. There is a band of clouds in front of me, and I begin to wonder if I'm going to have to descend back down into the bumpy, rough air to go under the clouds. As I close in on the clouds, I can see that they are actually spaced out quite nicely, and I end up taking an almost straight track all the way back to Entebbe. As I am landing in Entebbe I can hear Phil on the radio, landing over in Kajjansi. In the space of a few minutes I am starting back up again, having dropped off my passengers and their bags, getting my taxi permissions and taxiing out into position for departure to Kajjansi off of runway three-zero. I enjoy this short flight over to Kajjansi from Entebbe. We often drop passengers in Entebbe and then have this short, empty leg over to Kajjansi and on days like this it feels like a bit of a treat at the end of the day. Advancing the power lever, I let a smile creep across my face and pull the yoke back into my stomach, letting the nose of the airplane rise up to a maximum performance climb. With no passengers or cargo, I am easily climbing through 1,000 feet before I cross the threshold at the other end of the runway. Lowering the nose, I level off and make my way around the prohibited area where the presidents house is located, heading for Kajjansi. Five minutes later my wheels softly kiss the ground on the red murram runway back at home base. Another flight is done, another day in the books. I can feel the breeze flowing over my damp shirt as I climb down out of my pilots chair and onto the ground. As I complete the post flight checks and put my plane to bed for night, I allow myself to look forward to the evening ahead. I am dreading the drive home a little bit, and I hope that the traffic won't be to bad. It usually takes about forty minutes to drive home, but occasionally when the traffic is really bad it has taken over two hours. Forty minutes later I walk through the gate into my yard and am greeted by my wife, my kids and my dogs. Home again. It's just another ordinary day. Glad to make an appearance in one of your posts...even if it was as a "newbie". Go ahead and laugh it up. I'll miss randomly bumping into you up country. Maybe I'll be able to chat on HF from Chad. I wasn't lying. We've all done it too, and almost always when we're tired at the end of the day. Happy to have you make an appearance here.